LucasArts and Bioware just posted a new, quasi-animated short. 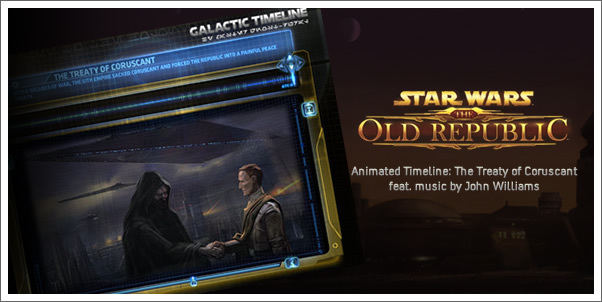 This appears to be the first of a series of timeline-shorts giving us the all-important "history" and backstory for the upcoming MMORPG, STAR WARS: THE OLD REPUBLIC. I have to admit I love these simple little stories. I'm not the biggest fan of the particular art style they are going with for this game, site and shorts, but I've scene a lot worse. I am also a sucker for Jedi/Sith "history." It holds far more potential than any "clone-story" ever could. Admittedly, my first time through this video...I hardly watched at all. Instead, I was listening. No. Not to the narration, but to the music, of course. I have been doing my best to find out who is doing the music for this game, but I have yet to get any answers whatsoever. I was hoping this video might give me a clue. Sadly, as it turns out...it's all recycled music from JOHN WILLIAMS' prequel efforts. It works well enough for the little animated short, but certainly didn't excite me. This might, in the end, prove to be what they do for the game (recycle Williams' score) which would be a cryin' shame. While Jesse Harlin has proven himself a capable musical editor on previous Star Wars games, the fact is, there are composers out there who would do a great job of holding to the musical tradition of Star Wars, while bringing in something fresh...and I don't mean of The Clone Wars variety either. So check it out. It's an interesting few minutes of Star Wars history. I think this Galactic Timeline series could hold my attention for a while...if only they'd inject some fresh music into the experience. Tell us what you think of the video, the game, and the music.